The drive through the centre of Scotland and North to Scrabster is one of the most scenic drives in Scotland and it was my second time at this charming and quaint Tearoom . Its the furthest North you can go before the Northern Isles and it feels magical . Scrabster has a charming little harbour and of course the Port for the sailings to and from Orkney etc but my interest was with Cups Tearoom and the lovely bubbly Ros Campbell , owner, proprietor and Celebration Cake extraordinaire. Cups is a very girly girl Tearoom and a cut above the rest in this area . The Cakes are just brilliant and a large selection awaits you of every kind of traditional and not so traditional cake. I tried many but my favourites were the caramel cake , so light and definately caramel . The courgette and Pecan was a really moist and flavoursome sponge as well. If you are ever thinking of a holiday or a journey North or even a Celebration cake ( I have never seen such attention to detail in a cake ) then please dont miss Cups Tearoom . Till we meet again Cups - Slainte ! Arlene's Coffee Shop was our first stop on the Isle of Mull . Just across from the Craignure ferry terminal lies this very busy little shop that caters for takeaway food,Coffees and sit- in Customers alike . I was only interested in the Cakes and boy was there Cakes. Right in front of me as you enter the shop is the biggest display of Homemade Cakes that you have ever seen from Cakes, Mousses ,Chocolates to Sponges,Traybakes and Cheesecakes. I would have been impressed just to stand and look at the Cakes alone. This is a mother and daughter team ,Ishbel and Arlene that are a hardworking duo in this busy shop . I arrived early and caught them all in a busy lunch time so i was happy just to gaze at the Cakes until a huge plate of almost every cake was delivered to my table . Left alone to my own devices i was in heaven. I tried the maple syrup and pecan Cheesecake,The Passion fruit and Blackcurrant Mousse cake ,Fruit Slice, Shortbread Pistachio and Lime cake and my new all time favourite - A Moorish Chocolate and Coconut slice - heavens above this was all first class Baking and skilled into the bargain. To Bake this size of display of cakes to the standard that is being achieved here is hard work and dedication ,but the skill involved is worthy of a Five star restauarant . Next time you decide to drive past a ferry terminal array of shops - think again as you may just be missing the best Cakes you have ever tasted . Well done Arlene's Coffee Shop and your team and keep up the good work. Duart Castle Tearoom sits in the stunning grounds alongside Duart Castle - ancestral home of the Clan MacLean. When we arrived the sun broke out of the Sky and lit the whole stunning location alight. The Caledonian MacBrayne ferry sails in and out past this Castle that has stood proudly since the 13th Century. The castle today is still occupied by Lachlan MacLean and is a beautiful example of our history in this country . Anyhow i digress , I was warmly welcomed by the manager Susan who gave me a quick run through all the cakes and recipes that they bake all day long in the old Byre belonging to the Castle. I sat at the end of the converted Byre and tried Shortbread ,Carrot cake ,Gluten Free brownies,Flapjacks and my favourite of all time A fruit cake Hunk ( I say Hunk as this was no fruit loaf slice ) This was quite simply the most moist ,tasty and superbly made Fruit Cake .This was an old recipe i was told and i still insist that no matter how many millions of recipes there are out there in fancy books by bakers and chefs you have never heard ,that the old recipes passed down through the generations are simply the best . 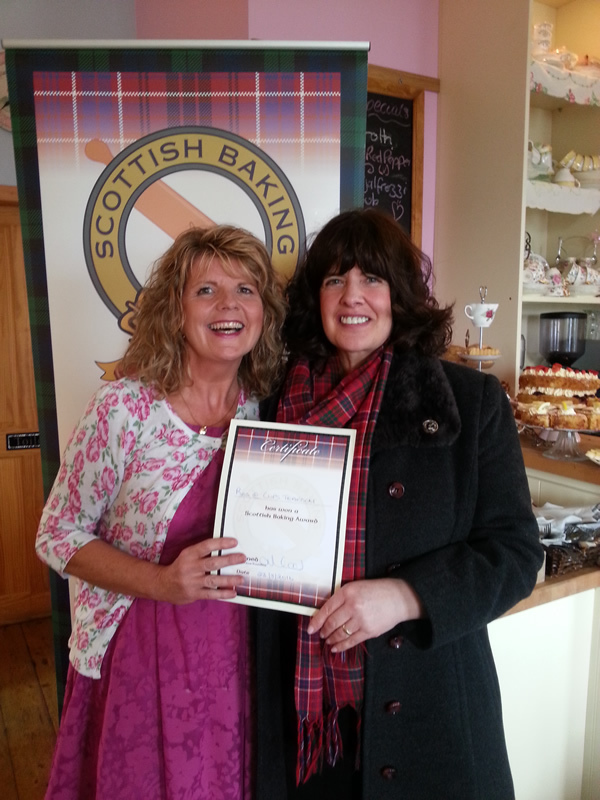 A pleasure to meet Susan and all the Bakers of which none do any more than the other . The vegetable and fruit garden in the grounds supplies the Tearoom for their salads and soups and i love this self sustainable way that today they are still maintaining the ways of the past . I loved Duart castle and everything about it and if you get the chance this is a must stop if ever in Mull . Well done Clan MacLeans !! Jon and Linda Pear run this very quaint and remote Tearoom from their home in Carbost - Isle of Skye. Jon is a professional Photographer and is not short of beauty in this stunning location on Skye . A real hit with Hillwalkers and Climbers this Tearoom is very busy . Linda provides the setting and the delicious Homemade Cakes. Too often i meet people like Linda that dont realise the talent they have and are not in need of being Awarded as they dont see the art of baking as anything special . WRONG ..... Linda and i am here to tell you that if more people baked like you as well as they could market themselves then the baking world would be a better place . The best Bakers that we have found in our long quest do not realise how good they are . The BEST Bakers are quite often not keen on the limelight or egotistical enough to market themselves properly and thats why i am glad to do just that for them . Linda your cakes were quite simply "Perfection" in my opinion . From the Apple and Walnut Cake to the Honey Cake and through to the Dundee Cake and Victoria Sandwich each were as perfectly baked as the next . Well done Linda and keep up the great Baking. We will be back soon . Ellishadder Art Cafe is in my humble opinion has the most scenic and dramatic landscape on the Isle of Skye . The breathtaking beauty surrounds you with stunning cliffs ,rocky seashores and shimmering water on one side and dramatic misty black mountains on the other . Words are not adequate to describe the beauty at this part of Skye. We rolled up to a very busy Cafe in the middle of all this scenery and wondered where everybody had appeared from . Ellishadder quite obviously has a reputation for good food and even greater cake . I positioned myself at an outside table to carry out todays Assessment and enjoyed the view whilst eating Nougat Cake,Tiffin ,Shortbread with a homemade lemon curd ,Carrot cake and my favourute was the Talisker Fruit cake - couldnt drive after this one !! Margaret the owner and hands on Chef/Baker told me no point calling it talisker Fruit cake if you cant taste the whiskey !! Great words . Margaret operates her very busy Cafe from her own home which is the " Norm" here on Skye and on many Islands in Scotland and i think it brings back a lot of what we have missing in our culture nowadays and that is a personal touch and hands on management . More of this would bring back our once high standards for customer service,value and quality and i for one am all for that . Well done Margaret. Today was our last day of Assessments in Skye and in the busy main town of Portree. Just as we had given up hope of finding excellent baking in Portree along came this wee gem in the name of "Cafe Arriba" This is a fantastic wee modern ,trendy, young and extremely busy Cafe . The view from one half of the Cafe overlooks Portree Harbour and from the other half of the Cafe your overlook the bustling main town of Portree- perfect location. The Cafe had such a great lunch menu that we stayed for lunch before the Cake intervention. Linda and her partner in crime Jenny make a formiddable team running this Cafe with all their staff. The cake display was large and varied with everything from Cheesecake to all the usual cookies and cakes ,but for me the star of the show was a fresh plum scone . I have not had plum in a scone before and it was as light ,tasty and as perfect a texture which needed no addition of jam. If in Portree this Cafe should not be missed not just for the excellent baking but for the Lunch menu and fanatastic ambience. We will be back . Emma Louise's Cafe is just outside the main drag in Lerwick and is a cracking little shop if you love the best Cupcakes in Shetland . I have to say in all honesty i am not a fan of the faddy Cupcake craze but this Cafe can seriously make great ones. Chocolate in a cake is notoriously difficult to get right without being dry and these were the best i had tasted in a long while. The best Chocolate Ganache for toppings and i was in heaven. The homemade Meringues were stunning and the Orange Cake was my favourite . Cupcakes are not this little Cafes only talent so i suggest you all pop in and try out these great cakes. Emma Louise was busy making over 200 canapes for a party this weekend so outside catering is also her bag. I also noticed the lovely little touch that you dont see everywhere which is the "Suspended Coffee" idea. This means for every Coffee you purchase -you purchase another without drinking it but the money for that coffee goes in a jar for those that cant afford one. I think this is a lovely idea and should be in more eating places. Anyway sadly i must leave the Beautiful Shetland Isles until another day but i will be back for Emma louises lovely Chocolate Cupcakes. Well done !